In 1987, 1 marina at the Wadden Island of Terschelling and the beaches of Noordwijk, Wadden Island Ameland, Veere and Westenschouwen received the first Blue Flag as the Blue Flag campaign started that year in The Netherlands. Now, 30 years later, these locations have still Blue Flag, 30 years after each other. But the program increased in the Netherlands to 182 locations. 122 marina's, 8 inland beaches and 52 beaches at the Dutch North Sea coast. At 18 May the municipality of The Hague hosted the 30st launch of Blue Flag in The Nehterlands. Al the Blue Flags from 1987 to 2017 waved at the pooles on the beach (thanks to the Blue Flag collegues of Portugal). 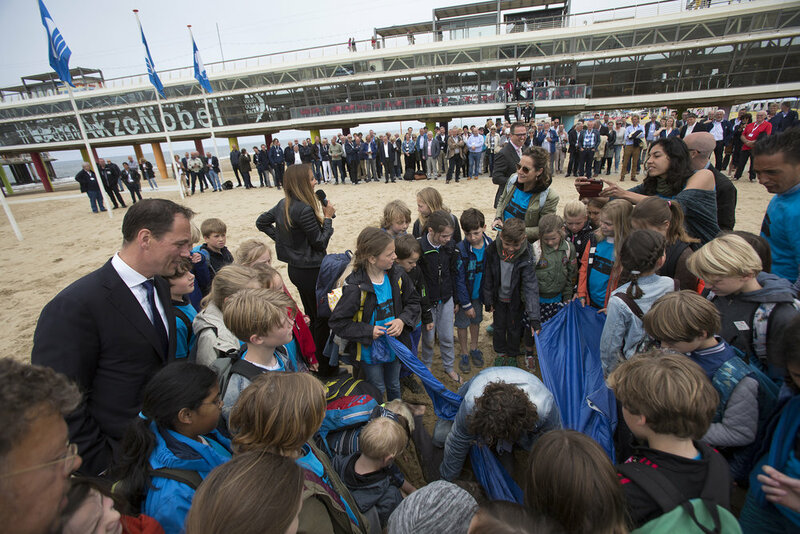 A lot of school children helped to open the 2017 Blue Flag season by digging in the sand of the beach. They found the largest Blue Flag of the world and spread this big flag out over the beach. The Blue Flag certificates were reached out to the beach and marina managers at the Olympic Top Sailing Centre at the Yachtclub Scheveningen.